For the Japanese communication satellites, see Broadcasting Satellite (Japanese). A direct-broadcast satellite (DBS) is a type of artificial satellite which usually broadcasts satellite television signals for home reception. The type of satellite television which uses direct-broadcast satellites is known as direct-broadcast satellite television (DBSTV) or direct-to-home television (DTHTV). The term "direct broadcast" is used to distinguish satellites which transmit radio or television signals directly to receivers in consumers' homes from other communications satellites which transmit signals to satellite ground stations, for example those which distribute cable television signals to cable head end facilities. 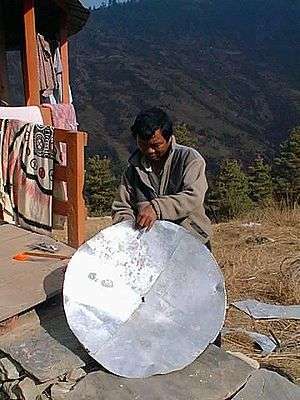 Since home satellite television receivers use small dish antennas less than a meter in diameter, DBS satellites must have much higher downlink transmitter power than other communication satellites, which are received by larger dishes from 2 up to 50 meters diameter. In Europe, prior to the launch of Astra 1A in 1988, the term DBS was commonly used to describe the nationally commissioned satellites planned and launched to provide television broadcasts to the home within several European countries (such as BSB in the United Kingdom and TV-Sat in Germany). These services were to use the D-Mac and D2-Mac format and BSS frequencies with circular polarization from orbital positions allocated to each country. Before these DBS satellites, home satellite television in Europe was limited to a few channels, really intended for cable distribution, and requiring dishes typically of 1.7 m.
SES launched the Astra 1A satellite to provide services to homes across Europe receivable on dishes of just 90 cm and, although these mostly used PAL video format and FSS frequencies with linear polarization, the DBS name slowly came to be applied to all Astra satellites and services too. As a technical matter, DBS (also known by the International Telecommunication Union as Broadcasting Satellite Service, or BSS) refers only to services transmitted by satellite in specific frequency bands: 11.7-12.2 GHz in ITU Region 3 (Asia and Australia), 10.7 - 12.75 GHz in ITU Region 1 (Europe, Russia and Africa), and 12.2-12.7 GHz ITU Region 2 (North and South America). In 1977, the ITU adopted an international BSS Plan under which each country was allocated specific frequencies at specific orbital locations for domestic service. Over the years, this plan has been modified to, for example, accommodate new countries, increase coverage areas, and reflect digital (rather than analog) technology. At present, numerous countries have brought into use their BSS Plan allocations. By contrast, the term DTH can apply to similar services transmitted over a wider range of frequencies (including standard Ku band and Ka band) transmitted from satellites that are not part of any internationally planned band. The term DBS is often used interchangeably with DTH to cover both analog and digital video and audio services (including video on demand and interactive features) received by relatively small dishes (less than 1 meter). A "DBS service" usually refers to either a commercial service, or a group of free channels available from one orbital position targeting one country. In certain regions of the world, especially in North America, DBS is used to refer to providers of subscription satellite packages, and has become applied to the entire equipment chain involved. The second commercial DBS service, Sky Television plc (now BSkyB after its merger with British Satellite Broadcasting's five-channel network), was launched in 1989. Sky TV started as a four-channel free-to-air analogue service on the Astra 1A satellite, serving both Ireland and the United Kingdom. By 1991, Sky had changed to a conditional access pay model, and it launched a digital service, Sky Digital, in 1998, with analogue transmission ceasing in 2001. Since the DBS nomenclature is rarely used in the UK or Ireland, the popularity of Sky's service has caused the terms "minidish" and "digibox" to be applied to products other than Sky's hardware. News Corporation has a 32% stake in BSkyB. PrimeStar began transmitting an analog service to North America in 1991, and was joined by DirecTV (then owned by a division of General Motors, GM Hughes Electronics), in 1994. At the time, DirecTV's introduction was the most successful consumer electronics debut in American history. Although PrimeStar transitioned to a digital system in 1994, it was ultimately unable to compete with DirecTV, which required a smaller satellite dish and could deliver more programming. DirecTV purchased PrimeStar in 1999 and moved all of that provider's subscribers to DirecTV equipment. In a series of transactions consummated in 2003, Hughes Electronics was spun out of GM and the News Corporation purchased a controlling interest in the new company, which was renamed The DIRECTV Group. In 2008, Liberty Media Corporation purchased News Corporation's controlling interest in DirecTV. In 1996, EchoStar's Dish Network went online in the United States and, as DirecTV's primary competitor, achieved similar success. AlphaStar also started but soon went under. 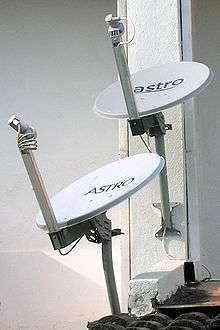 Astro was also started, using a direct broadcast satellite system. Dominion Video Satellite Inc.'s Sky Angel launched on a satellite platform in the United States in 1996, with its DBS service geared toward the faith and family market. It grew from six to 36 television and radio channels of family entertainment, Christian-inspirational programming, and 24-hour news services. Dominion, under its former corporate name Video Satellite Systems Inc., was actually the second from among the first nine companies to apply to the FCC for a high-power DBS license in 1981, and it was the sole surviving DBS company from the first round of applicants until the sale of their license to EchoStar Communications Corporation in 2007 and departure from satellite distribution in 2008. Sky Angel, although a separate and independent DBS service, used the same satellites, transmission facilities and receiving equipment used for Dish Network through an agreement with Echostar. Because of this, Sky Angel subscribers also had the option of subscribing to Dish Network's channels as well. In 2003, EchoStar attempted to purchase DirecTV, but the FCC and U.S. Department of Justice denied the purchase based on anti-competitive concerns. As of 2013, India has the most competitive direct-broadcast satellite market with seven operators (six private DTH and one government-owned FTA DTH) vying for more than 110 million television homes. 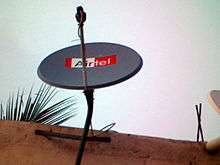 Subscribers to India's six private direct-to-home (DTH) satellite television providers have now reached 56.5 million, according to the latest figures issued by the Telecom Regulations Authority of India (TRAI)on 31 March 2013. Germany is likely the leader in free-to-air (FTA) DBS, with approximately 250 digital FTA channels (including 83 HDTV channels and various regional channels) broadcast from the Astra 19.2°E satellite constellation. These are not marketed as a DBS service, but are received in approximately 18 million homes, as well as in any home using the Sky Deutschland commercial DBS system. All German analogue satellite broadcasts ceased on April 30, 2012. The United Kingdom has approximately 160 digital channels (including the regional variations of BBC channels, ITV channels, Channel 4 and Channel 5) are broadcast without encryption from the Astra 28.2°E satellite constellation, and receivable on any DVB-S-compliant receiver (a DVB-S2 receiver is required for certain high definition television services). Most of these channels are included within the Sky EPG, and an increasing number within the Freesat EPG. ↑ "Satellitenfernsehen in Deutschland" [Satellite TV in Germany]. kabelfernsehen-kabelanschluss.de (in German). Retrieved 5 April 2016. ↑ "ZDFneo, 3sat, BR, NDR, SWR, WDR, Phoenix, KiKa starten HD Kanäle" [ZDFneo, 3sat, BR, NDR, SWR, WDR, Phoenix, KiKa launch HD channels]. kabel-internet-telefon.de (in German). 13 March 2012. Retrieved 8 April 2012. ↑ "HDTV: Neue HD-Kanäle von ARD und ZDF ab 30. April 2012" [HDTV: New HD channels from ARD and ZDF after 30 April 2012]. T-online.de (in German). 20 January 2012. Retrieved 8 April 2012. General frequency allocation information, mainly for U.S.